A rotator cuff strain is a tear to any of the four rotator cuff muscles in the shoulder and is common in throwing and racket sports. They are so called because their job is to rotate the arm at the shoulder and provide a supportive cuff around the joint. 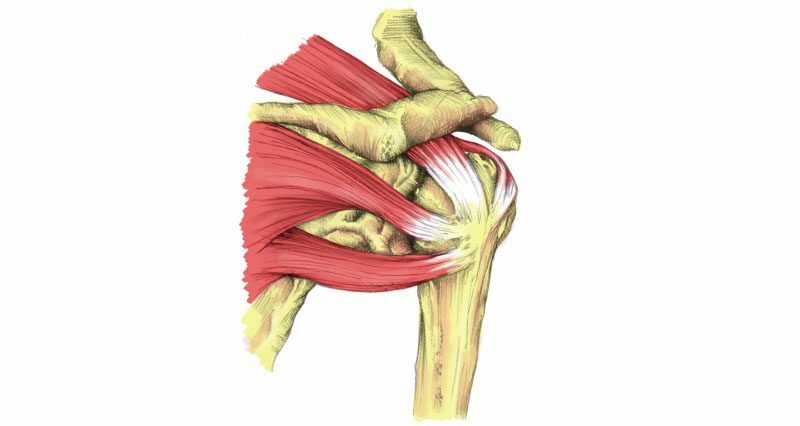 This shoulder injury can range from mild to severe and may be caused by activity in sports involving throwing and/or degeneration due to overuse. The patient will often be unable to sleep on the injured shoulder from the pain and there may be signs of shoulder impingement where the tendon pinches between the ball and socket of the shoulder joint, especially when moving the arm overhead. If the injury is initially mild then the athlete may continue to train, in which case pain in the shoulder may get gradually worse over time and eventually weakness in the shoulder will occur to the point where the athlete is unable to lift their arm up to the side. Pain is increased with movement and when stretching the shoulder. There is likely to be a significant loss of function although in mild cases the athlete may attempt to play on. The injured shoulder will have point tenderness at the location of the tear when pressing in. The muscles around the shoulder joint may be going into spasm and swelling may be visible. In more severe cases the muscle involved may appear deformed. Seek medical attention if the pain persists for more than 2-3 days, you are unable to work due to the pain, are unable to reach up or to the side with the affected arm after 2-3 days or move the shoulder and arm at all. There are a number of shoulder injuries which may have similar symptoms so a professional therapist will perform some specific tests to help isolate the rotator cuff muscles and reproduce symptoms. Empty can test – You will be asked to put your arm out in front of you at a 45-degree angle to your body, with the thumb pointing to the floor (as if holding an empty can). The therapist will ask you to raise your arm whilst they resist your movement. This tests the Supraspinatus tendon. Drop Arm Test (Codman’s Test) – Your arm will be moved above your head, and you’re asked to gently lower your arm to your side. If you can’t do this slowly and under control or have severe pain in doing so, it suggests a tear in the rotator cuff, specifically Supraspinatus. Abrasion Sign – You will be asked to sit and raise your arm to your side with the elbow bent. You will be asked to rotate your arm forwards and backward. If there is any crunching noise (crepitus) there may be some inflammation or degenerative changes. Neer’s Sign – The therapist will position your arm with the thumb facing down and at a 45-degree angle to your body. They will then lift your arm up, above your head. If you experience pain or discomfort, you may have an impingement of supraspinatus. Hawkins-Kennedy Test – Your arm will be raised in front of you to 90° and the elbow bent. The therapist will then medially rotate (turn the wrist down and elbow up) the arm. If this causes pain you probably have an impingement of Supraspinatus. There are four rotator cuff muscles in the shoulder which work together to provide the joint with dynamic stability, helping to control it as it rotates. Because the shoulder joint has a very large range of motion (compared to the hip joint) and often needs to move at very high speeds such as in throwing sports, there is a higher risk of injury to the muscles or tendons (tendons join muscle to bone). 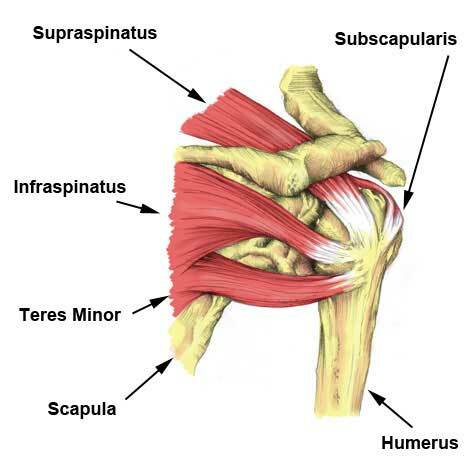 The rotator cuff muscles consist of the supraspinatus, infraspinatus, teres minor, and subscapularis muscles. Supraspinatus and Infraspinatus are the most commonly injured rotator cuff muscles particularly in sports which involve a lot of shoulder rotation, for example, bowling in cricket, pitching in baseball, swimming, and kayaking. The injury is also more common in the older athlete, particularly where long-term overuse or degeneration is present. In throwing events it is often the case that injury is caused by the rapid deceleration or stopping of the arm once the throw has been released rather than the acceleration phase of the throw. This is why it is particularly important to strengthen the muscles at the back of the shoulder if you are involved in throwing sports, not just the throwing muscles. Essential first aid for a torn rotator cuff muscle or tendon is rest and applying the PRICE principles of protection, rest, ice, compression, and elevation. Apply ice or a cold therapy compression wrap to reduce pain and swelling. The sooner cold is applied the sooner you will stop swelling, inflammation and pain and the faster the healing process can begin. Cold therapy can be applied for 10 minutes every hour reducing to 3 or 4 times a day as pain reduces. Rest the arm. A sling can sometimes be useful for more severe rotator cuff injuries if you still need to go to work school as it will immobilize the shoulder but can be removed at night. Once the acute stage is over mobility and strengthening exercises can begin as long as they are done pain-free. A doctor may prescribe pain relief and anti-inflammatory medication for a rotator cuff injury. Imaging studies such as x-ray, MRI or CT Scan can confirm the diagnosis, and rule out a fracture. Sometimes you might be referred for a steroid injection directly into the site of the problem to help reduce any inflammation and allow you to proceed with rehabilitation. A full rehabilitation program consisting of stretching and strengthening exercises will be advised. Professional sports people who want the shortcut to making sure the injury heals in the shortest possible time. Recovery time for a torn rotator cuff will vary depending on several factors. Conservative treatment has a 40-90% success rate at fixing the problem. Surgery often has good results, with some studies citing a 94% satisfaction rate with the surgery, resulting in lasting pain relief and improved function. Very extensive tears often have a poor surgical outcome, however, this injury is thankfully quite rare. If you are older, it will take longer to heal. The aim of shoulder rehabilitation exercises is to restore full mobility to the joint, strengthen the muscles and restore full function. Mobility, stretching, strengthening and functional (sports specific) exercises are important. Exercises should always be done pain-free. Pendulum exercises involve letting the arm hang down and swing gently, gradually increasing the amount of movement. These are more important for particularly severe injuries and it is likely you would move onto more advanced wand or pole type exercises where a pole is used to help increase the mobility of the joint. Read more on shoulder mobility exercises for rotator cuff. Stretching exercises move on from mobility and should be done as soon as pain allows. It is likely that if you have suffered a rotator cuff strain then the muscle involved may have gone into spasm or shortened and will need stretching. Try to find the stretching exercises which feel like they are working and perform them regularly throughout the day. Front of the shoulder stretching can be done against a wall and the back of the shoulder by pulling the arm across the front and holding it into the chest. A therapist can perform a simple muscle energy technique which involves contracting the muscles then relaxing to a rotational stretch. This is particularly affecting in increasing shoulder range of movement. Read more on stretching exercises. Strengthening begins as soon as pain allows with isometric or static contractions. These involve contracting the muscle against resistance but without movement, for example against a wall. These progress onto dynamic exercises using a resistance band or weight and involve movement. Lateral (outside) rotation is particularly important and can be done in a number of different positions to target the muscles in different ways. Read more on strengthening exercises. These are more sports or activity specific exercises which are done later in the rehabilitation program. They are designed to bridge the gap between strengthening exercises and the demands of the sport. They may be different depending on your sport. Exercises using a medicine ball get the shoulder moving in a more natural way and help restore the proprioception or coordination of the shoulder joint.